After a whirlwind month or so of work, which has caused me to seriously neglect this blog, I was able to get away. Seriously away. No Internet access. Little phone signal. Just me and my amazing sqweeze and a little house a short walk from the beach. 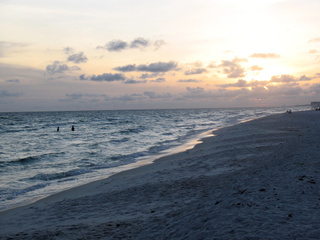 The healing and rejuvenating powers of sleep, the ocean, and laughter cannot be stressed enough. I have come back refreshed and inspired – about blogging and most everything else. We didn’t do as much cooking as I had thought we would. More time was spent lounging on the couch, drinking wine, and playing Yahtzee on the beach for hours. The few meals we made were quite simple – grilled meat, marinated veggies (the leftovers of which we fed to our favorite bird, Larry). On our last full day there, I made a killer "fridgecleaner" Panzanella salad with all of the delicious, fresh stuff left lying around. Fresh summer corn, squash, beautiful basil, just right ripe tomatoes all going in with hunks of rosemary bread. The taste of everything together – and the TEXTURE – was out of this world. Anything you have around the house would work in this salad – be loosey goosey with it and don’t worry about the size of the chops – or anything else for that matter. – Combine all cut ingredients in a large mixing bowl. Add cooled bread pieces to raw ingredients and mix thoroughly. Gradually add EVOO, salt and pepper to desired level of seasoning and dressing. Serve immediately. Your vacation sounds blissful! And I’m glad you had the time to go away with your ‘squeeze’. 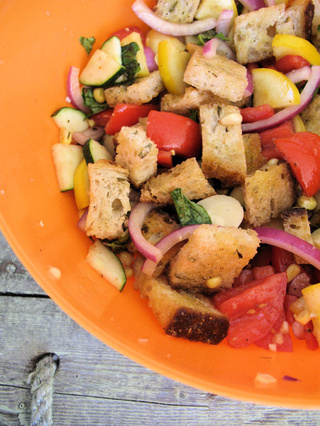 :) I love the colors of the panzanella, I’ve never tried it before but want to now. Thanks Tami! :) I’m actually here often, but don’t comment much. I’ll have to change that.